When are schedules available for my child’s competition? Schedules are posted 7 days prior to each competition event. 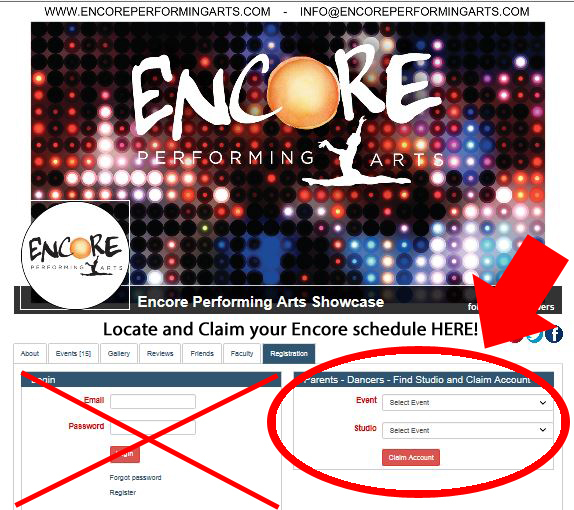 Go to the “Register” link at the top right of the Encore Home page. What time do doors and dressing rooms open? Doors and Dressing rooms open 30 minutes prior to competition. Do I need to check my dancer in at the Encore desk? Dancers do not individually check in at the Encore registration desk. Studio directors and teachers only need to check in. Is there an admission charge to watch competition? No, admission is not charged. Am I allowed to take photos and videos? No photography or videotaping is allowed. Encore provides a professional videographer in each of our competition cities. Photos and videos are available for purchase on site only. Photos and videotaping IS allowed only during our awards ceremonies. Are parents allowed on stage during awards? Absolutely no parents are allowed on stage for our awards presentation. Will the competition be streamed online? For the protection and privacy of Encore’s dancers, choreographers, and teachers, Encore events are not live streamed to our website.